Last year, while I was browsing my YouTube subscribed channels, I came across a really interesting video that Elena from Elena Reads Book. While watching this, I found that I could relate to the predicament where she had found her TBR was getting out of hand and the dreaded Reading Slump had hit hard. To try to combat this, Elena and Janet from Swirly Girly Reads had decided to participate in Bookopoly 2018. The aim was to have a Monopoly type board with various genre’s replacing the street names associated with the Game. This was coupled with various challenges tied to the other squares and the cards. 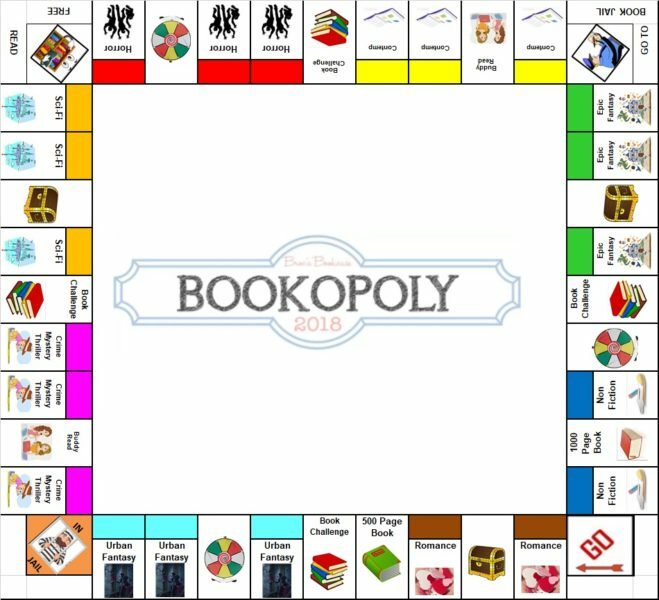 Christmas and New Year Preparations meant that I wasn’t able to put together my own Bookopoly board. The challenge slipped my mind until I saw Hannah from Broc’s Bookcase posting on Instagram about the same challenge. So, this kicked my motivation into gear. So, you may be asking how this all works? The general idea is pretty much like the game monopoly with a few minor adjustments. As I said above, genre’s have replaced the street names. Everytime that i read a book in a specific genre, I put in a value into a piggy bank. If I read two Romance books, I will have completed the brown colour. After that each book would equal a house, just like in Monopoly and I would put that specified amount in the piggy bank. If I read 5 it would equal a hotel for each square. 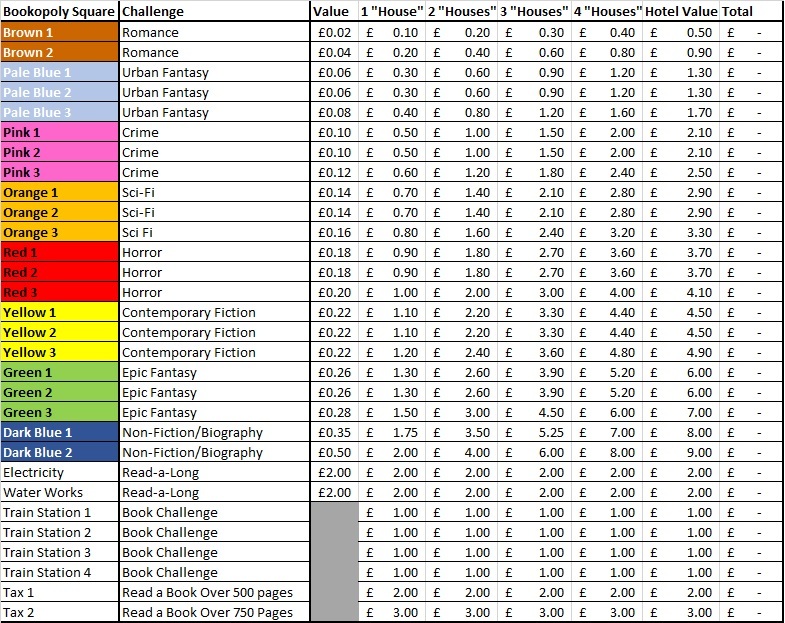 After I have completed all squared with 5 books, that colour is complete and any more books I read in that genre would not result in putting money into the piggy bank. I have replaced these with Buddy Reads. This is when I decide to participate in a Buddy Read with someone from one of my Social Media contacts. The Two Tax Squares have been replaced with a book that has over 500 pages and a book that has over 1000 pages. 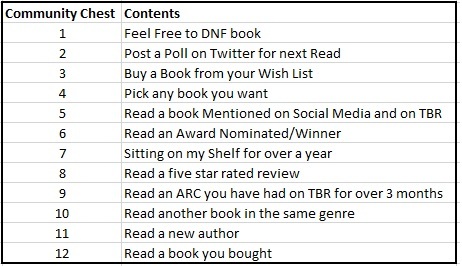 If I read a book that meets this criteria or is one of the genres on the board, I can choose to put in the value for either the tax or the genre value. I have come up with twelve “cards” for each”. At the begining of each month, I will pick a piece of paper out of a hat and I will carry out the Community Chest and Chance “cards” task. I got this idea from Elena. 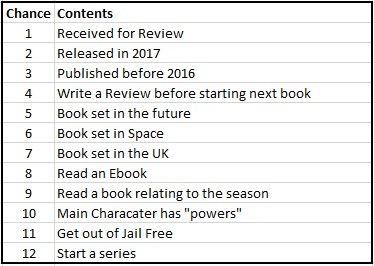 If I buy a book, I have to read that book straight after my current read is finished. I can’t move on to any other challenges and I can’t claim the value for that book if it falls into a genre. I do hope that this helps and if you want any more information on the challenge, be sure to check out Elena and Hannah’s posts and videos.